Speaking of cooking, what has been inspiring you lately? There have been a few things on my brain. The first is fresh bread! Sourdough is all over my Instagram feed (I recommend checking out Ruth's account!) and it always looks so delicious and crusty and warm and comforting. Most recently I baked the artisan multigrain bread from A Couple Cooks' new cookbook, Pretty Simple Cooking, and it was excellent all toasted up as a side for some hearty soup. Which is a perfect segue into my next latest obsession, which is the Instant Pot. Now, we don't cook with the Instant Pot everyday, but everything we've made with it has not disappointed us. And the best part is definitely the time! Specifically, how much time it saves. Last week, I wasted a bunch of time watching Top Chef (hah) and suddenly it was four o'clock and there were no dinner plans in sight. I initially grabbed my phone to text Andrew about eating out (again) but then changed my mind and took a look at our fridge to find celery, potatoes, carrots. A little bit of Googling later, and I found Pinch of Yum's Crock Pot Lentil Soup, which called for nearly everything I had in the fridge and pantry already. It was perfect, but it was a crock pot recipe! So I was semi-bummed I hadn't found the soup sooner. And here we enter the hero, the Instant Pot! It made a 6-hour soup into a 1-hour ordeal, and I couldn't have been happier with the result. Neither could Andrew - we saved some money, and had a healthy, nutritious, and filling meal at home instead. Pure comfort, and practical. The best of both worlds. The last is savory bakes! I've mentioned before that this is the year of savory here! So much so that I've almost considered transforming Nommable into a cooking and a baking blog? So much so that I've tried to convince Andrew to contribute savory meals to the blog? Tiny Asians Cook Dinner?! I die. But the reality is that we probably don't actually have time to sustain a cooking blog, but a girl can dream. 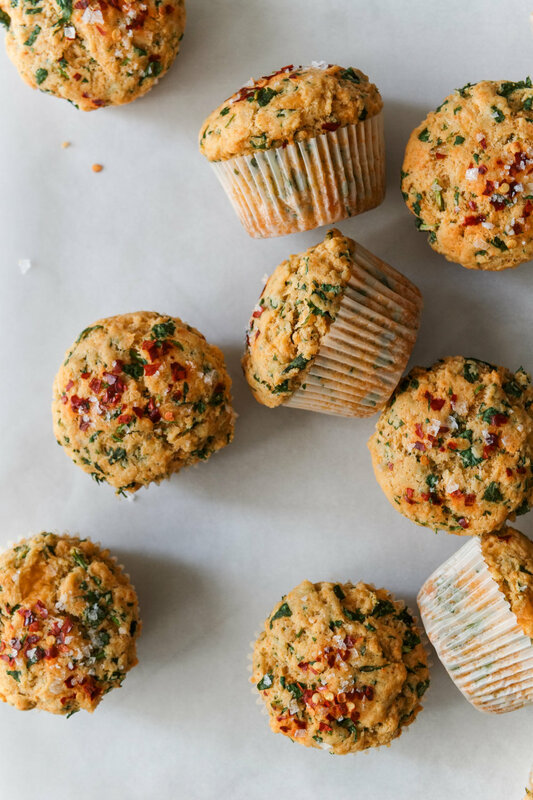 So I'll stick to savory bakes on this little blog for now, including these cheesy, herby muffins. 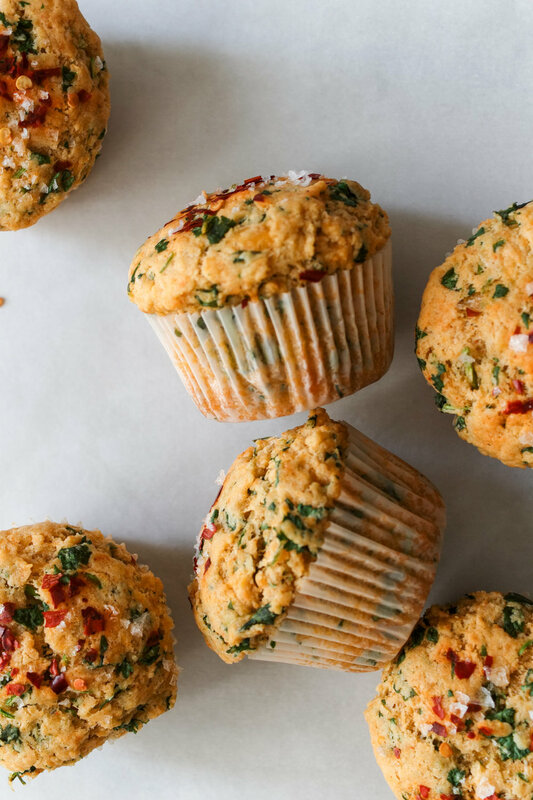 Ovenly's cookbook has been a consistent source of inspiration for me, and these guys are adapted from their heavenly feta, basil, and scallion muffins. I love the adaptability of their recipes; you truly can take whatever is in your fridge and make it work! In this case, sharp cheddar to replace the feta, handfuls of bright, fresh cilantro in lieu of the basil and scallions. They are perfect for your savory, salt-loving friends, as a side to your soup or even as a breakfast on the go. Preheat oven to 350 F. Line a muffin tin with 12 baking cups and set aside. In a large bowl, whisk the flour, sugar, baking powder, spices, salt. Whisk in the cheddar and cilantro and set the bowl aside. In another large bowl, whisk the heavy cream, canola oil, and eggs until smooth. Scoop the batter into the baking cups so that they are filled about 3/4 full. 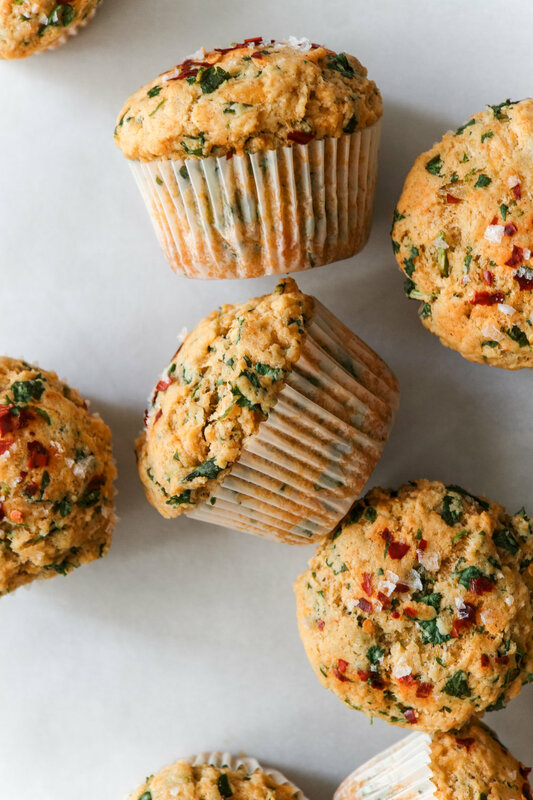 Sprinkle the tops of the muffins with some flaky sea salt and red pepper flakes. 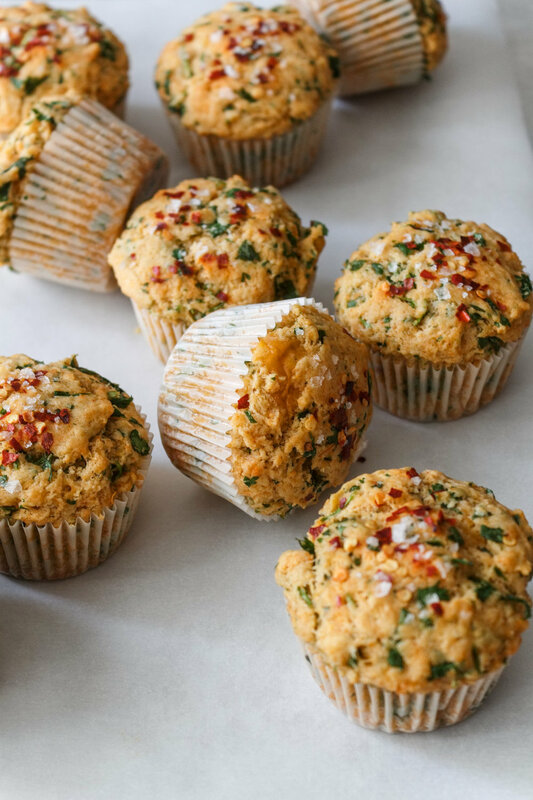 Place in the oven and bake for 20 minutes, or until a toothpick inserted in the center of the muffins comes out clean.